Republican presidential nominee Donald Trump and Democratic presidential nominee Hillary Clinton shake hands after the presidential debate at Hofstra University in Hempstead, N.Y., Sept. 26, 2016. For months, Hillary Clinton and Donald Trump have been telling supporters about their plans for the country and lobbing criticism at each other. On Monday, they got to do it in person at a debate that largely gave voters a reiteration of the candidates they have come to know. There was Trump's denial that he supported the war in Iraq, his blaming Clinton for the rise of Islamic State and her charge that he has no plan to defeat the militant group. He again questioned whether she has the stamina to be president, and she said he lacked the temperament for the office. Clinton said Trump's economic plans would benefit the rich, and he said the wealthy will create jobs for the middle class. 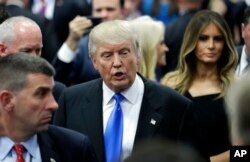 “I think that what we saw was very, very much the Trump that we’ve been seeing up until now and the Clinton that we’ve been seeing up until now, and so probably most voters are going to have the same material that they had before and it probably won’t move the needle very much," said Hans Noel, an assistant professor of government at Georgetown University. Noel told VOA he expected Trump would make a shift to being more moderate, like fellow Republican Mitt Romney did in 2012, and that others expected Clinton to be focused on delivering her message and not engaging with Trump. But he said neither happened. The election in November will have a winner, and at each step along the way there is often a focus on who is ahead in polls and who wins events like the debates. Multiple polls, including those from CNN/ORC and Public Policy Polling showed Clinton as the winner Monday night. Talkwalker, which examines social media trends, said mentions of #NeverHillary outpaced #NeverTrump 66 percent to 34 percent before the debate, but that by the time it ended hashtags supporting Clinton were at 68 percent compared to 32 percent for Trump. Cary Covington, an associate professor of political science at the University of Iowa, said Trump was "very forceful, very assertive," while Clinton appeared "more calm and in control." "Hillary Clinton demonstrated commands of policy questions," he told VOA. "Donald Trump focused in on a small number of issues that he wanted to talk about, [but] wasn't as adept at speaking broadly to the range of topics that were asked about." Former President Bill Clinton kisses Democratic presidential nominee Hillary Clinton as she and their daughter, Chelsea Clinton, greet supports during the presidential debate at Hofstra University in Hempstead, N.Y., Sept. 26, 2016. Covington said presidents have to be ready for any question that concerns the nation's interests, and that during the debate Clinton "did a better job of at least addressing the merits." That included, he said, a question about her use of a private email server while she was secretary of state that has drawn great criticism and which she again Monday called a "mistake." The campaigns, and particularly the many debates that have taken place since Democrats and Republicans began the process of nominating candidates last year, have brought extra focus on journalists and others fact checking what Clinton and Trump say. That continued Monday with statements like Trump's assertion that he never called global warming a hoax "created by the Chinese," which he said on Twitter in 2012. Clinton said Monday of the Trans-Pacific Partnership she "hoped it would be a good deal," but when she was secretary of state she repeatedly touted it only to change her position during her presidential run. Noel said voters watching at home are likely to believe the candidate they already like. "Most people have already made up their mind, so when Trump says something and someone challenges him on the facts and he says no, no I’m still right, the people who are inclined to like Trump are going to continue to think that way, they’re going to believe that," he said. "And the same when Clinton says something and some people challenge her on that or push back and then they’re going to say I’m going to believe her because they already did." Republican presidential candidate Donald Trump speaks in the spin room after the presidential debate between Trump and Democratic presidential candidate Hillary Clinton at Hofstra University, Sept. 26, 2016, in Hempstead, N.Y. Both candidates were, unsurprisingly, positive about their performance after the debate, with Clinton saying she felt great and Trump declaring himself the winner. Covington said the ultimate outcome depends on what each felt they needed to accomplish in a race that Clinton has generally led in polls but which has recently become tight. "Trump’s goal has to be to overtake Clinton. That’s a much more difficult task. That means persuading people who are either on the sidelines or are leaning towards Clinton to come over to his side. I don’t think he did much to help himself on that goal, but it’s a more demanding goal than the one that Hillary Clinton faced," Covington said. "Hillary Clinton needed to reassure voters who don’t want to vote for Trump that she’s acceptable, she’s already got the lead. She was able to give that impression."